The ExtraHop supported Azure integration delivers unparalleled visibility into real-time IT operations that help you make the most of Microsoft Azure and gain control over your cloud and hybrid IT environments. While ExtraHop delivers insights from all data in flight observed on your network, by integrating with Azure Monitor and Activity Logs, you get a centralized view of all IT assets in a way that&apos;s never been possible before. This integration includes visibility over your entire Azure subscription for Virtual Machines, Storage Accounts, SQL Server Databases, Load Balancers, and Activity Logs. From resource utilization to performance, access changes to Azure Security Center events, we surface the information that matters. Log into Azure and complete the instructions in the following topic: Deploy the ExtraHop Discover Appliance in Azure. Log into Azure and complete the instructions in the following topic: Deploy the ExtraHop Explore Appliance in Azure. Log into the ExtraHop Web UI on your EDA and complete the instructions in the following topic: Upload and Apply the Bundle. Be sure to enable each of the Azure triggers. Log into the ExtraHop Admin UI on your EDA and complete the instructions in the following topic: Enable Open Data Context. Note: For this integration, you only need to enable default TCP port 11211. Click the Deploy to Azure button to begin the Azure Integration deployment. a. In the Subscription field, select the subscription where the EDA is deployed. b. In the Resource group field, select Use existing and then select the resource group where the EDA is deployed. c. In the Location field, select a desired region. In the Settings section, fill out each of the required fields. Hover over the ( i ) on each field to see an explanation about the field. The deployment will take approximately 30 minutes. After the deployment is complete, continue onto the next step. Before the deployed Function App can communicate with the EDA, you must configure a Point-to-Site VPN, which Azure refers to as a VNET integration. Select the Function App Name that was specified in the deployment. 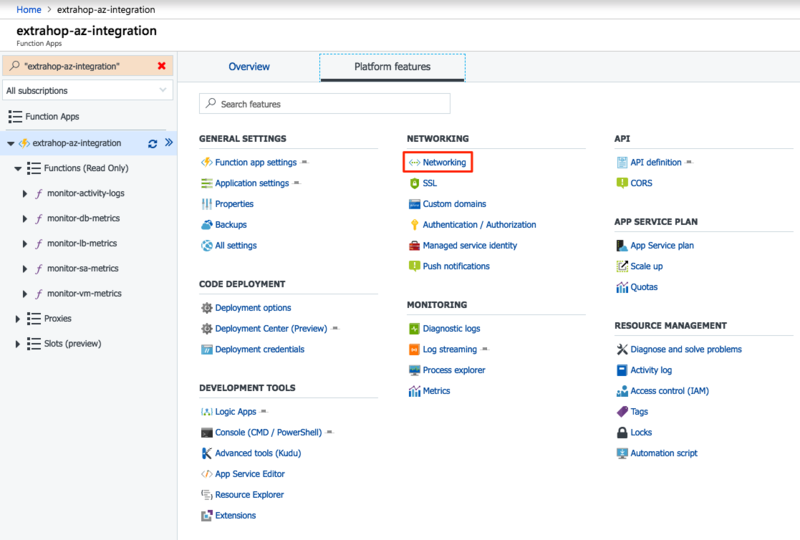 In the VNET Integration section, click Setup. Select the Virtual Network that was specified in the deployment. a. 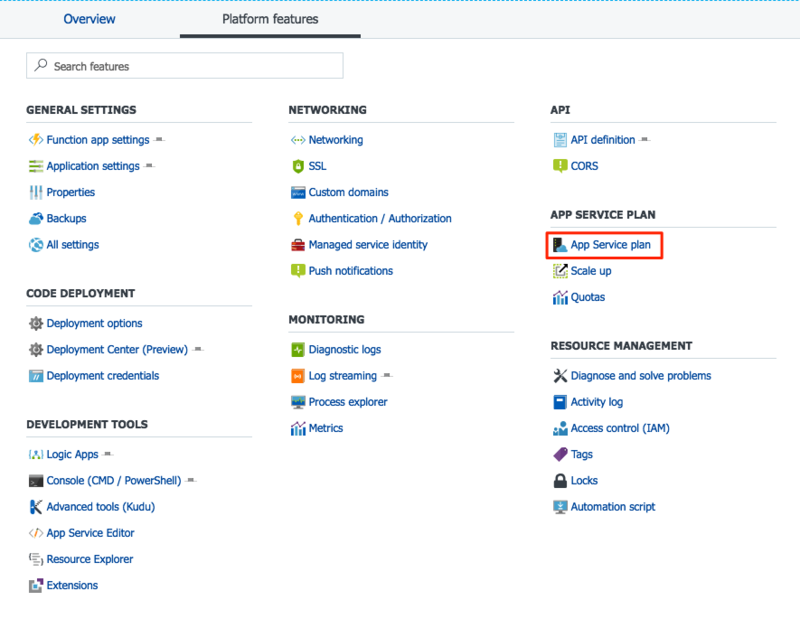 In the Function App Platform features section, click App Service plan. b. In the App Service plan Settings section, click Networking. c. In the VNET Integration section, click Click here to manage. d. Select the Virtual Network that was specified in the deployment. Wait until all of the sync operations are complete and then verify that they were successful. If any of the sync operations were unsuccessful, wait a few minutes and click Sync Network again. Repeat this process until all of the sync operations complete successfully. Before the deployed Function App can access metrics from all of the resources in the subscription, you must add a reader permission on the subscription level. Select the subscription specified in the deployment. a. In the Role field, select Reader. b. In the Assign access to field, select Function App. c. In the subscription field, ensure that the subscription specified in the deployment is selected. d. Select the Function App Name that was specified in the deployment. You must go through each of the following Azure services supported by this integration and bulk assign a tag to the specific resources that you are interested in having Azure monitor metrics. You must complete the following steps for each Azure Service above. Navigate to the service within Azure. Select all of the resources that you would like to monitor. In the Name field, type extrahop-azure-integration. In the Value field, type true. Navigate to the Resource Group. Enter the tag information from above. Before the Azure Integration can properly correlate virtual machine metrics with the associated devices within the EDA, you must be receiving wire data from those virtual machines. You can either complete the steps in the Packet Forwarding with RPCAP guide or use Azure virtual network TAP by completing the steps in the Work with a virtual network TAP using the Azure CLI guide. The source for the Virtual Machines dashboard on the EDA depends on a device group that contains all of the tagged Azure Virtual Machine devices that are sending wire data. Create a static device group named Azure Virtual Machines. Add each of the tagged Azure Virtual Machine devices that are sending wire data to the Azure Virtual Machines group. Note: The time it takes for the EDA to discover the L3 devices for each of the Azure Virtual Machines can vary depending on how active the devices are and how much traffic is generated.